A baby blanket is an easy project for a beginner knitter. You can use simple knitting patterns and instructions and create plain or striped blankets. You can also easily add color interest by using variegated yarn. When you start knitting, you often knit a square. Think of a baby blanket as just making a much bigger square. When it comes to easy patterns to knit, garter stitch is often the first thing people think of. Garter stitch is usually the first stitch you learn when learning how to knit. In garter stitch, you simply knit every row. It's possible to make pretty projects with it before you even learn how to purl. If you're looking for easy baby blankets to knit, garter stitch is a good place to start. 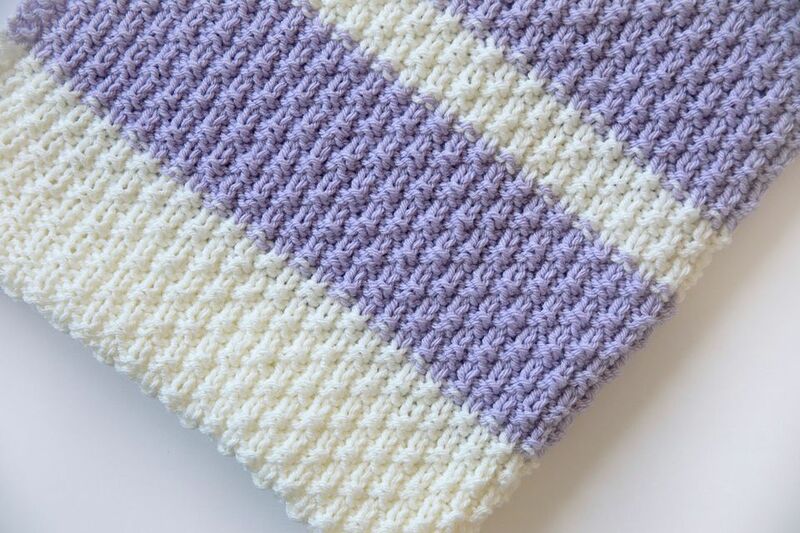 This garter stitch baby blanket involves two colors and is worked with two strands of yarn throughout, making a super warm and squishy blanket that's also pretty fast to knit. In the same vein are the super easy baby blanket and its variations, the new version and the crib blanket version, from Purl Soho. All of these use stripes to make them a little more interesting to knit and to use, but you could always make a solid color one if you'd rather, or use a multicolored yarn. A step up from garter stitch for easy baby blankets would be using a stitch pattern that includes knits and purls. Ribbing is a common form of this sort of pattern, but you don't have to just use it for the edging. It can be really effective as an allover pattern. Rib-based knitting patterns you should check out include the garter rib blanket from Orange Flower Yarn and the broken rib blanket by Bonnie Evans. Slip stitch knitting is an easy way to give your projects a little more color and/or texture without a lot of work. Many slip stitch patterns involve the use of two colors, but only one color is used on any row, so it's not that difficult to master. Some projects use a single, multicolored yard. Stitches are slipped with the yarn in front so that you get the texture and color of the yarn floats as part of the design. The addictive baby blanket by Renee M is a project that uses a solid color and slip stitches that show on the front of the work, giving an almost cabled effect. When you're ready to delve into two-color slip stitch knitting, try the Mirbeau slip stitch baby blanket by Brenda Lewis, Ann Aschenbrenner's new life baby blanket (which uses brick stitch) or the ​woven slip stitch blanket from Peg Baker. The Grandmother's favorite blanket was inspired by the famous washcloth pattern of the same name in which yarn overs are used to create the edging of a blanket worked from one corner out and back again. You'll find the same idea in the gleeful tweed baby blanket from Lion Brand Yarn. The oh so soft baby blanket by Jennifer Jackson is another cute choice that only has eyelets in some of the panels. Alternatively, the sweet dream baby blanket from Paris Knit is another pretty project that only uses eyelets every few rows as well. Any project that uses an allover stitch pattern or is worked in panels is going to be great for newer knitters because you don't have to concentrate as much if the pattern repeats. Try the easy baby blanket form Ing-credible Threads Designs, which alternates stockinette and reverse stockinette with a seed stitch border; the round or pinwheel baby blanket by Genia Planck; or the ​chevron blanket from Escape Tricot.